Today unattended deployment of Windows has matured. With free tools like Microsoft Deployment Tool (MDT) and Windows Deployment Services (WDS), getting to the point where you can deploy an operating system to a workstation uattendedly is easier than ever. It is a known fact that WDS has two drawbacks: Image management and that is a bare-metal install only. With MDT, you have applications and Out-of-Box drivers, but it's difficult to control, unless you accept that all computers get everything. Add to this that this will be a snapshot of drivers and applications at OS install time and therefore client installs will be different every time you change the configuration. There is no long-term consistency. This page will show you how to use FastTrack to solve these problems by reducing images with intelligent post-install driver and application deployment and also ensure driver and application consistency between new OS deployments and already deployed machines. In fact, you only need one basic hardware independent image that you never need to touch. If you are using a cloning tool, the same applies. You can use the same recipe and only have one hardware independent golden image with no custom drivers or software at all. You can also add other post-install customizations, such as your own logic for computer naming. At a high-level, what you need to do is to set up software deployment with FastTrack. This is not intended for OS deployment, but for general purpose software distribution. Please review this page for instruction on how to set it up. The trick here is to include the current configuration (which includes a list of conditional drivers and applications) in the OS setup process. This ensures that the deployed client is exactly the same as all other computers at any given time. We only need a bare-metal install without additional drivers or applications. Minimum number of images needed with either WDS, MDT or a cloning tool (only one image in fact). Consistency between drivers and applications deployed as part of the OS deploy and existing machines. Higher granularity in conditions for installation of drivers and applications (manufacturer, model, geographical location, computer OU, etc). In the simplest form, all you need to do is to set up software deployment, include install of the client MSI file (for future updates) and build a one-time installer and execute in the setup process and you're set. This way the client MSI will ensure that future changes hit the machine and the one-time install will ensure that everything is installed, before the user gets the machine. You could opt to not even use the one-time installer and let the client MSI handle everything after the user gets the computer to save install time, but this would not be a good service to the end user. 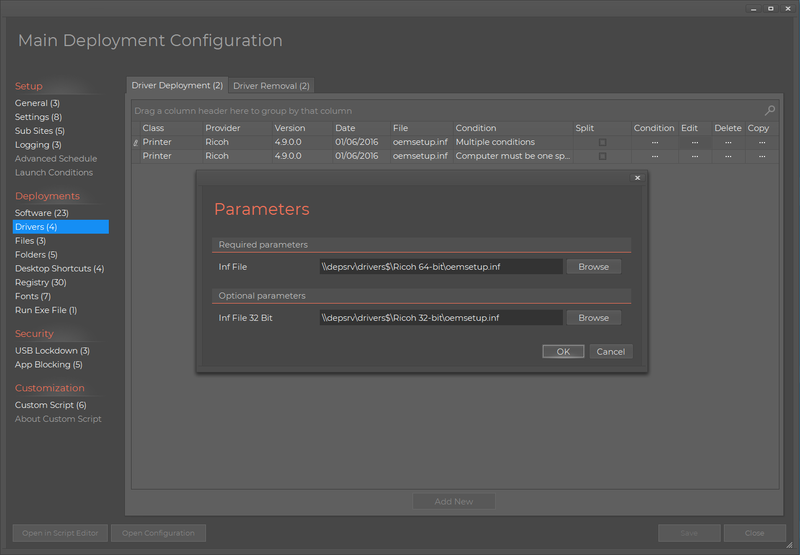 Below are screenshots of the main page and drivers page of software deploy. The details of how to install the MSI and run the EXE is up to you. The rest of this page will layout one possible way of doing this automatically as part of WDS deployment and also an advanced example of embedding advanced scripting into the process to control naming of computers and other customizations. If you have questions or problems setting it up, please contact support at the top menu and we will help you. In this section, we will deploy Windows 7 using WDS (formerly RIS, Remote Installation Services). This section is also valid for other means of distribution, such as using SCCM or sysprep'ed cloning technology. We will simply be using the $OEM$ folder of a Windows install image to for our custom files at the very end of the installation process. This is officially documented here on TechNet. 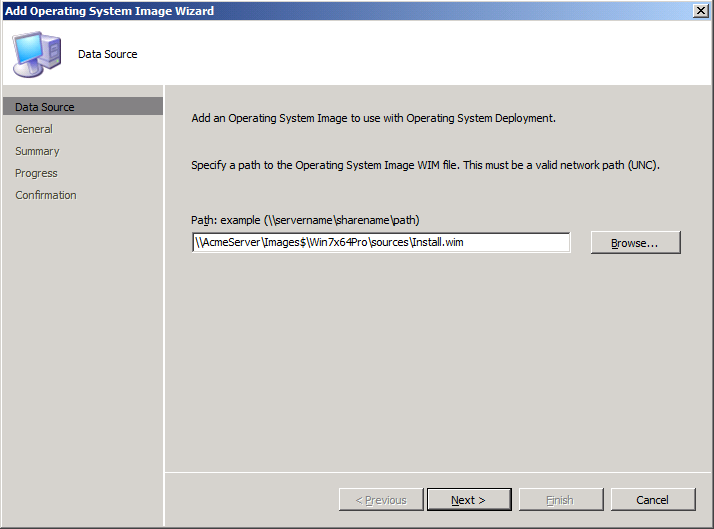 In this example we will use Windows Deployment Services (WDS) to push the image out. If you are unfamiliar with WDS or unattended Windows 7 deployments, please refer to the documentation from Microsoft on WDS or the Windows 7 Step-by-Step Deployment guide. We need to get a FastTrack Script executed as part of the installation process. To do this, we will use the Windows feature that looks for a file called SetupComplete.cmd before the final reboot, as explained here. For this we need 4 files. To get them to the client before the installation is complete, we will use WDS' OEM structure to avoid having to modify any image files. If you have already setup unattended Windows 7 installations through WDS, you can simply follow this procedure to get a script executed without modifying your existing images. As shown in the previous section, we need to execute a FastTrack script after base OS install to install drivers and applications. There are basically two ways to deploy drivers and applications: We can put all driver and software files in subfolders and write a script (option 3 below). 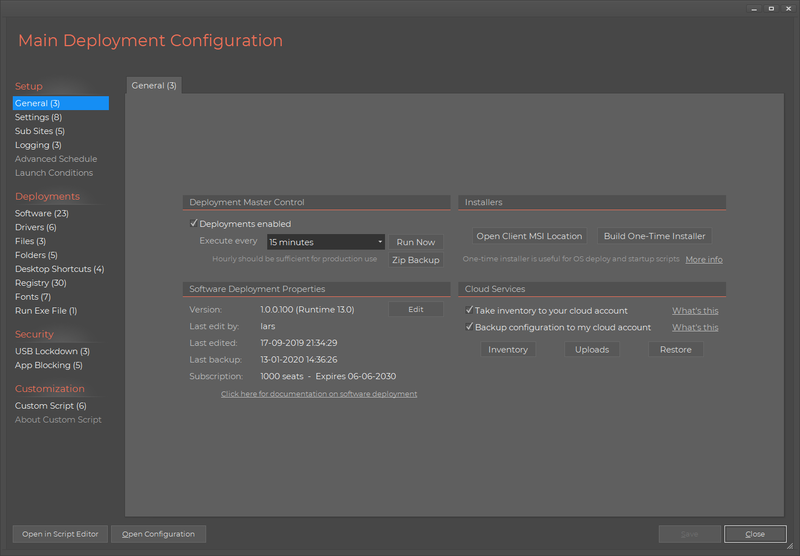 Or we can use the software deployment feature that was explained under the "High-level Concept" at the top. The only real benefit of the script approach is to contain all files within the process, in case some of the drivers are required to get network connectivity. In such case, a hybrid of the two could also be used, where option 3 is used to install basic network drivers and then let software deploy handle the rest. At the top, we talked about consistency. This the main reason why the first option is best, is because we use the same drivers and software library for OS installation and general updates on clients. It's simply the same script that is used after OS installation that is also used for recurring updates on clients. This means that if you add or replace a driver in software deployment, it will both be updated on running machines AND be used in fresh OS installs, ensuring complete consistency on all machines. The Software Deploy part must be set up first. If you deploy the client through group policies, you do not have do anything further, because the client (ftclient.msi) will automatically get deployed, once the machine restarts. If you do not deploy the client through group policy, you can manually install it using the prelogon.fsh script. Copy the ftclient.msi file to the $oem$ folder (same folder as preinstall.fsh) and now we simply need to install this MSI file in our preinstall.fsh script and nothing else. All that happens is that we install the FastTrack software deployment client and we are done. 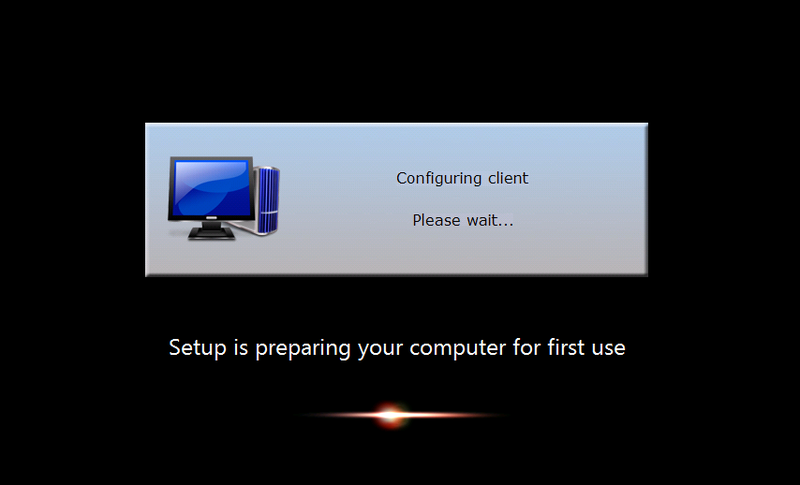 When the computer is started first time after OS deployment, the client will start to install drivers and software. This approach has no extra waiting time for the IT guy, but it's a leap of faith that everything will be in order, once the user boots the computer for the first time and the software deployments kicks in to install drivers and application. Let's assume the exe file was saved as OneTimeInstaller.exe and put in the same directory ($oem$) as the preinstall.fsh script file. To successfully execute the whole configuration of software and drivers, the tricky part is that at this stage, the machine is not yet joint to the domain and therefore we need to establish credentials before executing the exe file. A complete script would look like below, where you have to replace the domain admin username and password (instead of the EncryptPassword function, you can encode a password in the Script Editor by pressing F8). A splash screen is set in first line, so we can see that there is some wait time at this stage, as shown in the screenshot in the previous section. Observe that we should still include the ftclient.msi file, because although it will have no effect right away (because the OneTimeInstaller.exe did the job), we would still want the client installed to handle future changes. Note that if you deploy the client through group policies, you should not include the last InstallMSI line, because the client will be installed after reboot. 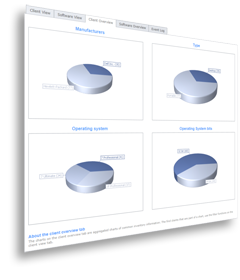 You could also opt to put all the driver files and software in the $oem$ folder and write a script. This is reasonably simple, but requires you to understand the scripting language and write a script in the Script Editor. You can avoid using software deploy this way, but if you still use Software Deployment, you would still want to install the ftclient.msi as part of this script. The below is a basic example, but it's a template for all you need. The first line will install a video driver, if the manufacturer of the hardware is "Lenovo". The second line combines to conditions; the machine must be an XPS 15 model manufactured by Dell. The third line will install Office 365 on all machines and forth line will install Adobe Reader. And this script can be expanded with as many lines as needed using these four types of lines. The example script in this section does an array or customizations to demonstrate the power of using the scripting language for advanced customization. You can pick snippets of it to for example control computer naming. You would want to merge this script with the above driver and software deployment script. In this example script, we will take over the process of joining the domain and your Windows answer files must be stripped of domain join information. The password used in the example script to join the domain is encrypted, which removes the need for an easy-to-retrieve plain text admin password in Windows answer files, opening up unsecure domain joins or using manual prestaging. In the previous section we talked about how to get a script to execute before the final reboot and in this section, we will present an example script. The script is directly available in the script editor: Go to the "Documentation" tab, select "Windows 7 Deployment Script" under the "Insert Example Script" submenu. The script is explained in detail in the next section. To construct and test a script of this type, it is not necessary to run a full Windows installation for every test iteration. Just execute it on a computer that is not in the domain. To test again, unjoin the domain and repeat this procedure until the script is finalized. Both passwords must be encrypted in the script editor by selecting "Encrypt Password" in the "Tools" menu. For further details, look at the next section for the details in the example script. Do NOT run the script on your own computer. Unless the script fails to connect the share, it will rename the executing computer.
'' NEW MACHINE: GET THE SEQUENCE COUNTER FROM A FILE IN THE ROOT OF THE DISTRIBUTION SHARE CALLED CLIENTSEQUENCE.XML.
'' GENERATE A NEW COMPUTER NAME IN THE FORMAT "ACMExxxx" BY PADDING THE COUNTER TO 4 DIGITS AND PREFIX WITH "ACME"
'' RENAME THE COMPUTER NAME AND JOIN THE DOMAIN. The script will connect a network share called W: with the supplied credentials. This share can be any share on the network and must contain a folder named "ClientFiles", which contains files that will be copied to all clients. Furthermore, the first time the script is executed, two xml files will be created in the root, to keep track of client naming and for re-using computer names, when re-installing clients. There are no special requirements for this share. Just create a folder on a server, share it and place a "ClientFiles" directory in it. We will refer to this share as the distribution share from here on. In the root of the distribution share, an xml file will be created the first time the script is executed and it contains a sequence counter that can be changed at any time. The name Acme, number of decimals, and other computer name formatting can be edited in the script itself. If the computer must be placed in a specific organizational unit, simply use the JoinDomainAndOU instead of JoinDomain in the script. If there are multiple naming formats or multiple OU's to place computers in, you can create multiple copies of your install images with different Preinstall.fsh files. Alternatively, a menu could be shown, asking for a list of choices to feed to SetComputerName and JoinDomainAndOU. This would however break the idea of a completely unattended installation. If you already have computers and want to start with a higher sequence count, simply create a ClientSequence.XML file in the root of the distribution share with a default content, as shown below, assuming first computer should be 400 in the sequence. When the script is executed, the script looks in the file for a node called MAC_xxxxxxxxxxxx where the x's is the mac address of the fastest network adapter in the computer. If a value is returned (Acme0001 in the case the mac address is 00155D010136), this name is used and a new name is not created. The intention with this operation is to give a certain group, which is not a member of domain admins, local administrator permissions. This could typically be Help Desk users that need to service the computer. The executing user is not a domain user, thus credentials to the domain must be established to get access to domain objects, in this case an Active Directory group. To establish credentials, the domain admin user is impersonated with the ImpersonateUser command. The next command, AddGroupToLocalGroup, will put a group into the local administrators group using the impersonated credentials. An additional administrator account is created. The purpose of this is to avoid having to give the local administrator password to service operators, in case the computer needs to be serviced offline. A folder called C:\AcmeShared is created and any user will get full control over the folder. The purpose is to let users share files locally that are not needed to be backed up and take up network storage. The SelfInstall command will copy the executing engine (from %WinDir%\Setup\Scripts) and the license file to "FastTrack Software\FastTrack Scripting Host" under the Program Files directory and associate the .fsh extension to the exe file. This will allow execution of .fsh files on the computer without specifying where the exe file is located. If you are using FastTrack Logon for logon scripts: It is important to understand that when using FastTrack Logon, it will copy its own copy of the engine to the user's profile, execute the login script with this copy and make a user association to .fsh files to this copy. If the user then executes an .fsh file, it will be this copy that is executing the script. If the system, a local user or a user that does not use FastTrack login executes a script, it will be the copy installed under Program Files. This is because a user file association superseds a system file association. And the reason why this is important to know, is that if at some point in the future a newer version is used for login scripts, this will not be a problem because FastTrack Logon's copy will supersed a system installed copy of the engine. On the administrative share, any files under a folder named "ClientFiles" will be copied to the same locations on the client. If there for instance is a folder named Program Files\Acme, this will be placed in the same structure on the client. This can also be accomplished by putting these files inside install images, but usually this means there are multiple copies of the same client files, increasing maintenance time and the chance of inconsistency. Typically there would be further scripted manipulation related to your additional files, like creating shortcuts in the default user's profile, setting registry values related to the files, etc. These things can easily be inserted after the copying. Also, if you have scripted your installations, these could also be included with simple include commands. See unattended installation for more details on scripted installations. One last note is relation to unattended installations of Windows. If you don't have a management system, you don't know what is installed on which computers, who has what computer or what hardware is in which computer. With this one command, you will have full hardware and software inventory of your computers. It is a good idea to include this same command in your regular logon script also, as the upload will then include information about who logged on to the computer the last time. 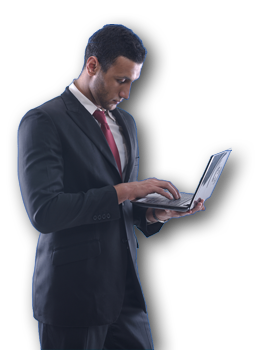 SkyBox has no additional cost; it just requires your clients to be licensed and within maintenance period. Refer to this page for more information on SkyBox.